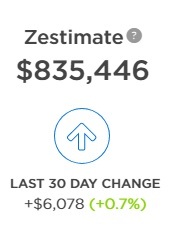 According to Zillow, our home is currently worth $835,446 (up $6,078 in the last 30-days). Is the housing market seeing a cool down, or is there still a second push as those looking to buy a home before the next school year start going into escrow? Regardless, since we have no intention of selling our home, the fluctuations in the market means little to us. We mainly post these updates to see the remaining mortgage balance and keep us motivated to push forward to be debt free (including our mortgage) one day! For those that have not read the Preface on our home equity, we currently hold a 15-year fixed rate mortgage at the incredibly low rate of 2.875%. My goal is to retire within 10 years and 0 months (120 months) so we are setting out to pay off our mortgage on or before my retirement date. Right now we are a few months behind the target retirement date. Currently, we have approximately 10 years and 10 months (130 months) left on our mortgage. Nevertheless, I would like to have it paid off in another 10 years (or less). If we accomplish that, I plan to use the last few years to aggressively build our passive income to help supplement our retirement and defer tapping into the 457K as long as we can so it can continue to grow. Looking forward to you breaking the $280K balance remaining next month! This is my first time posting on this blog. That's an impressive account of your mortgage balance update. I bought my first home last year, so I don't really have any equity in it. But, with the huge equity you have in your residence, that's certainly a nice safety cushion that gives you very good options should you decide to use it. Great report and looking forward to more awesome updates. Congrats on your home purchase. Be patient, I'm sure you will build equity slowly but surely. Glad you found our blog and hope you continue to follow along on our journey. When you buy next year, make sure you keep your mortgage payment as low as possible. I know the recommendation is to stay below 33% of your family's annual income but I personally think 25% provides you with much more flexibility and freedom to invest or otherwise cushion any unforeseen expenses.